I have created a fairly simple mod that will do much customization for you and you can just move the mod from install to install. This will install your Portraits, Scripts, Characters and Player Soundsets (with strings). It does require the user to edit a few paths, but hopefully the instructions in the ReadMe are simple enough to understand. Let me know and I can edit it. There seems to be some confusion as to the location of the override folder. Just to clarify where to create the 'override' folder if you do not have it already. Create it in your main Program Files install INSIDE the 00766 folder. Been playing with this for a while to ensure its working. Only problem I see are some of the sound texts are wrong. Just be aware of that, you may need to tweak them yourself and certainly will if you add another new soundset. Still, its a good example that people can use. 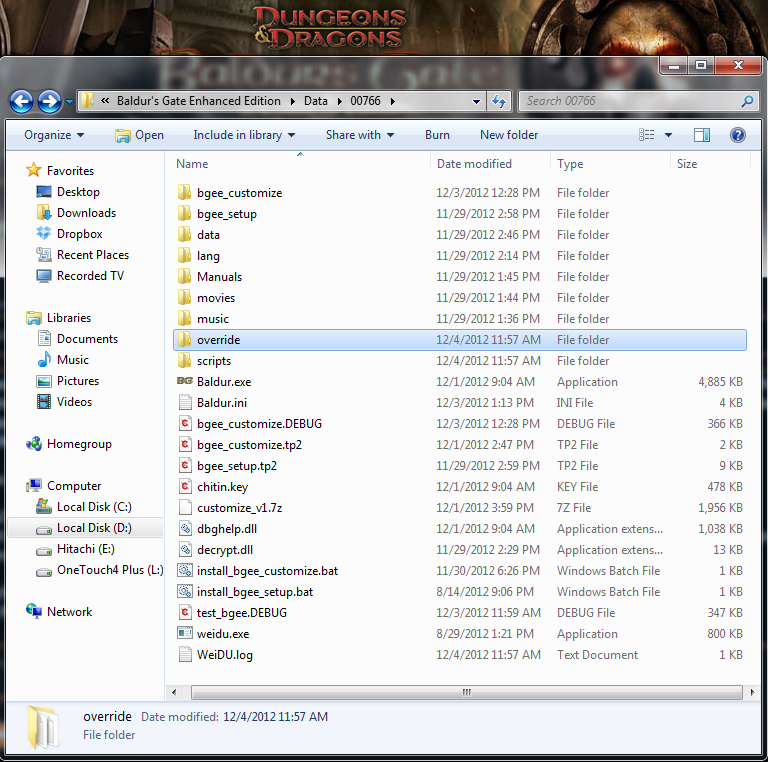 My override folder is found here: F:\BeamDog\00766\data\override and I think the compiler is looking for it elsewhere. Is there some way I can point it here? edit: I just sent you the .debug log. @Azchar111 Have you tried putting your override folder in the 00766 folder instead of the data folder? I think that would help. Will my override directory still function correctly outside the data folder? Yes, I tested Cuv's mod for him with the override directory outside the data folder and the portraits changed for me, the scripts installed and the soundset worked. It will work fine outside the data folder. I've read this sounds portion over and over again, and I have absolutely no idea what it is talking about, and I have a degree in physics. Do I even need to install anything if thats all I want? Is it just telling me to unzip things to a folder, delete your sounds, and rename my custom soundset to your sounds names? What 'example' is included? Edit: Ah, I see - the example .2da and the example soundsets. See though, how do I know what to rename under the old naming scheme to match your new naming scheme? I'm trying to convert the Driel soundset for use, and I'm getting pretty frustrated. This should be something really quick and easy. Edit2: I see again - the format of the names is the same, it just looked different because I was comparing Drielx with Female7X, and so on, so it was confusing. Now I just have to figure out where to copy this .2DA file you have, I think? LastEdit: Huh, seems to be working now with even just a basic copy/paste. Not sure why. I tried installing a soundset yesterday and it wouldn't even play, but now its working just fine, with the renamed-everything, and without. Well, not looking a gift horse in the mouth. But if you want a simple way to install and uninstall your custom stuff... use it to plug in your own numbers and files/filenames into the TP2/TRA and folders... then just run the installer. But of course, that takes a little more action on the user's part. Updated topic post with override location since there seems to have been some confusion on where that should go. You will need the override for any other mods that come out too. I haven't tested this yet, but I must applaud your effort for doing this. I really hope more people start adding to the community and the community surrounding Tutu can jump on this and create their own modifications and player-driven content. does anyone know the Clua Code for Dradeel ? Do you know what exactly is wrong with adding soundsets? I had a couple custom ones working a week ago but they all seem to have stopped, even the FEMALE7 one that came with it. Not sure why! I never touched that entry and only added strings at the end. Yes, something has changed with the way sounds are done it seems. We all might just have to wait a bit for some confirmation from the devs. ... and a fix. Custom soundsets will work if you add the wavefile reference in the .tra file (i.e. '@7 = ~Yes?~ [FEMALE7H]'). I've been using a modified version of Cuv's mod to add both the FEMALE7 and another soundset for BG2, and they both work fine. We'll have an easier end-user solution for custom soundsets soon. I think some of the changes that broke the functionality were related to stuff we had to do to make it easier to add subtitles to soundsets. Changes are relatively simple for any modder or mod installer (and it works better, to be honest) but for the end user who just wants to dump files into the soundset directory and have it work, it no longer works properly -- so, hopefully we'll have a solution for next patch that makes life simple. PS: I already try with the SK, but it's been difficult to me make it work. @Skin_Robber You can use Ctrl+6 or Ctrl+7 to scroll down or up through the animations in the game until you find the one you want to use. Select your character with cheats enabled, hold down Ctrl and press 7 to scroll up through the animations. ....its really easy with SK, I don't think there is an easier way. Tried to download this 12/3/13 but can't be unzipped as it's apparently corrupt?. Just tried downloading from SHS and extracting. All looks fine. 7z opens it fine, not sure what you are using. This is kinda old stuff now.... apart from just the 'how to package a mod' example that it is... most of the things in it are a year out of date. Throw that weidu.exe away and grab the newest one, for example. It is a zip file or a 7Z? I truly want custom soundsets and I can't make them work in any way I've tried (in BG:EE, they work fine in BG2:EE). This is exciting, since I've been unsuccessful at adding my own soundset so far and no one seems to know why it doesn't work, I'd love to give this a try. If someone would like to try my soundset to see if they can get it to work for them I'd appreciate it. I specifically remember in the past when working with Icewind Dale 1 & 2 soundsets, having to use a tool to convert my custom sounds from .wav to a special kind of .wav format, or a slightly tweaked .wav format before they would work in the game. I even had to use the same tool to use .wav files from the game in applications and such I made for the fun of it. In order to make the .wav files from these games work with a .NET application I had to run the same process, but in reverse. I am really surprised no one has brought this up in any of the threads I've looked at about this "muted" sound issues, because this is exactly what my problem is and I would bet my fingers that it's because my .wav format is not the 'correct' kind of .wav. Android>data>com.beamdog.siegeofdragonspear>files is the one for the stand alone SoD, hence I guess the others would be same route with title of BG1 or BG2 instead of the siegeofdragonspear entry.